Rewind: Radio Active | TV, eh? Fellow prisoners, welcome back to the wacky world of Upper Redwood High, as Rewind takes a look back at Radio Active. Teen sitcoms are all the rage these days. Between Nickelodeon’s iCarly and Victorious and Disney’s ANT Farm and Shake It Up!, kids can’t seem to get enough. Homegrown stations YTV and Family Channel are also producing their own, including the likes of How To Be Indie, Mr. Young and Debra!, most of which have been sold overseas. While the market may currently seem lucrative, it hasn’t always been that way. Teen sitcoms on networks such as YTV and Nickelodeon were rarities just a few years ago. They were often lost among a sea of absurdist cartoons like Angry Beavers and Animaniacs. Canadian kids networks concocted the likes of Angela Anaconda and Stickin’ Around for the 90s absurdist cartoon era. 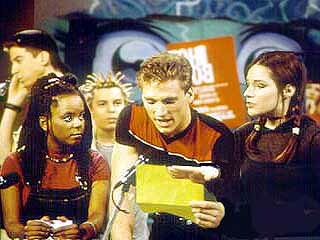 While the 90s were dominated by cartoons, Nickelodeon did find success with Clarissa Explains It All and YTV later found similar success in Radio Active (1998-2001), a show about a bunch of students who run a high school radio station, which was also named Radio Active. Radio Active was based on the 1995-2001 Canal Famille (now Vrak.TV) show Radio Enfer and it also aired on Nickelodeon. Both shows were early examples of the teen sitcom renaissance which soon came into full force shortly after the shows’ runs. Radio Active‘s humour holds up fairly well and with only a few dated posters and an old Macintosh really holding back as a relic of the 90s. The show follows a group of high school students who had to maintain a C average to keep the radio station alive, so they would often try to help each other study and grew to be a tight knit group of friends. They were a rather quirky bunch and their antics throughout the show’s run included using the school radio system to help a fellow student pass an oral exam and broadcasting gossip over the radio. As with many Canadian shows of the time, some elements felt a bit unpolished. In the pilot you could see the end of a set wall and a bit of what looks like a camera or light on screen. It also had only a handful of sets and lacked extras such as other students and teachers to the point where you might start to wonder if the stars of the show were the only ones in a really, really small school. Despite that the characters felt well rounded and distinguishable. Kevin was a bit of an egotist and brought most of the physical comedy to the series. He was ball of energy and not all that smart. Morgan was down to earth and had a bit of a sarcastic vein in her. Sarah, Morgan’s younger sister, often came in rolling in on roller skates, squeaky and was rather quiet annoying. Tanya was a sweet and naive bookworm. Eaton was money hungry but boring. And spiky haired George was a weirdo, often calculating some sort of odd conspiracy theory. As the series went on Kevin and Eaton were replaced by Blair a buff, popular but dimwitted athlete and Roger a lanky smart guy. Even while watching the show in its original run I felt there was a great age disparity between the actors. In the TV world, actors in their early to late 20s often portray high school students. In fact Vanessa Lengies, the actress who played Sarah, still plays a high school student on Glee. While the kids of Radio Active didn’t feel as if they mere caricatures, the school staff fell more into that pitfall. Mr. Noseworthy was the one who usually fit into whatever teacher role the plot needed and was genuinely a nice guy who often went on with stories from his youth. Ms. Atoll on the other hand was simply a ruthless authority figure. With the similar theme of high school broadcasting, Radio Active could be compared to the some what similar current teen sitcom, What’s Up, Warthogs!. While Radio Active followed the zany world of high school radio, What’s Up, Warthogs! follows the antics of a high school TV news show. Considering that this was a sitcom, the Warthog’s news show plays out more like Weekend Update than your typical evening newscast. As Canadian television production has gotten arguably better since the late 90s, it could be said that it has rubbed off on What’s Up, Warthogs!. The show has more believable sets than Radio Active and the production value seems miles better. The same can’t be said in the writing department; the jokes feel more set up. The overall humour of the series seems a bit different than Radio Active choosing to go more for silly and absurd things. The situations in What’s Up Warthogs! don’t feel exclusive to a school environment as did most of the ones in Radio Active. In fact you might wonder if these kids have class at all. For example, the episode of What’s Up, Warthogs! I caught involved opening a time capsule and a character attempting to travel back to the past. It’s a scenario that feels like it could be applied to virtually any mainstream sitcom, in one way or another. See how What’s Up, Warthogs! stands up to Radio Active by catching up with Radio Active or discovering it for the first time yourself with YouTube.